From a plot standpoint, Throne of the Crescent Moon is about a power struggle between the iron-fisted Khalif and the subversive Falcon Prince. In the midst of a brewing rebellion, a series of brutal supernatural murders strikes at the heart of the Crescent Moon Kingdoms. The 60-year old Doctor Adoulla Makhslood, is the last real ghul hunter in the great city of Dhamsawaat and his young assistant Raseed bas Raseed, is a holy warrior whose swordsmanship is matched only by his devotion to God. When they learn that the murders and the Falcon Prince’s brewing revolution are connected, they find themselves in a race to save the life of the tyrannical Khalif. Throne of the Crescent Moon reads like the debut novel of someone who spent years honing his craft. 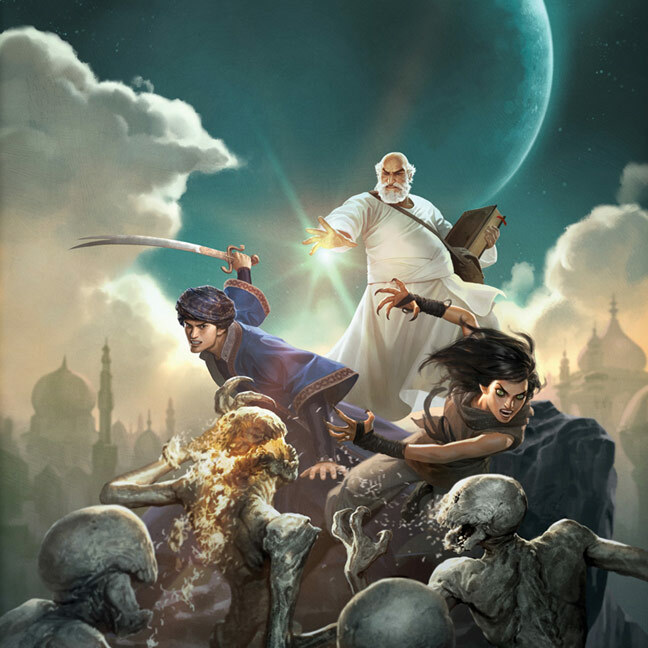 Told through a surprising number of points of view (I count six off the top of my head), Throne of the Crescent Moon is a quintessential sword and sorcery novel. The characters are world weary, cynical, and fatally flawed. They’re common by birth, possessing a strength of will that is decidedly not. Adoulla and Raseed are more heroic in nature than the traditional self-centered characters of Howard or Moorcock, but the in-the-moment, personal conflict, is very much in their image. At the novel’s conclusion I’d never once been surprised by the directions Ahmed chose to take. What did surprise me, is that I didn’t care in the least. The characters, and the method and content of their interactions, are just that good. When I say method, I am referring to Ahmed’s prose and command of dialogue. Throne of the Crescent Moon reads like the debut novel of someone who spent years honing his craft. Given the recognition that Ahmed has garnered for his short fiction, with both Hugo and Nebula Award nominations, I guess that’s exactly what he’s done. Accessible is a term that’s thrown around like a pejorative when it comes to literature, and some may levy that criticism here. To me, it demonstrates a confidence in his craft. He does not rely on verbosity to communicate his setting or his character’s affectations, rather he uses their unique voices, providing ample beauty in construction of the whole, not the parts that constitute it. Adoulla, the old and skeptical realist, and Raseed, the young and energetic idealist, square off again and again in didactic discussions of their world view. Content is a slightly more murky discussion. Ahmed uses his two primary characters to set up paradigms of extremism versus moderation, and cynicism versus optimism (among other things). Adoulla, the old and skeptical realist, and Raseed, the young and energetic idealist, square off again and again in didactic discussions of their world view. It should be noted here that Ahmed is an Arab-American and a Muslim. As a White-American (which perhaps ironically includes those of Middle Eastern heritage) and a non-religious person, I read much of this interaction as a commentary on the disagreement in the Muslim world between fundamental and moderate Islam. I can only imagine that a Muslim might read it more like a rebuke of the lack of respect toward Islam in the United States. To others, it might be either, and both. There lies the beauty of Ahmed’s novel. Another character, Zamia, a tribeswoman from outside the ‘civilized’ city, begins a similar discussion of old and new, tradition and progress. Raseed is Adoulla’s foil, but Zamia’s counterpart is the setting itself — the city of Dhamsawaat. Drawing heavily from his heritage, Ahmed paints a world that would sit nicely in the Fertile Crescent. Marketplaces and street vendors, methods of greeting and social mores, quotations from scripture and religious traditions, will all call to mind pictures of various Middle Eastern cultures, but also of a fully realized world that belongs to Ahmed alone. Zamia, in her dedication to tribal ways, comes to all of this fresh. Isolated and uncultured, she begins the process that many are forced to undergo in the developing world as familial and tribal affiliations are slowly eroded. Far on the back-burner in Ahmed’s narrative, it’s an interesting thematic aside, and something that would bear further exploration in future novels. As I began this review, I questioned whether I should mention Ahmed’s background at all. What does the fact he’s a Muslim have to do with the quality of his novel? The answer is nothing, and everything. This is an unexceptional sword and sorcery story, but it is an unexceptional sword and sorcery story with an exceptional point of view. It is Ahmed’s point of view, Barry Gordy’s ‘soul’, that makes Throne of the Crescent Moon special; and it is his background that creates it as much as his talent as a writer. There’s more in Ahmed’s 288-pages than in many of his 600-page peers. 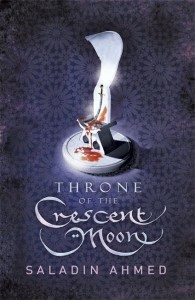 Throne of the Crescent Moon is 288-pages long [ed. This review refers to the original Hardback release]. It’s one of the shortest hardbacks I’ve held. Ahmed does not have the market power of Brandon Sanderson, who put out a similar length novel in 2011, Alloy of Law. Some might say that a 288-page novel isn’t worth $25. Trust me when I say, there’s more in Ahmed’s 288-pages than in many of his 600-page peers. In case it hasn’t been clear thus far, I loved this novel. Saladin Ahmed joins a growing group of writers in genre fiction like Lauren Beukes, N.K. Jemisin, Nnedi Okorafor, Tobias Buckell, Paolo Bacigalupi, and others, who redefine what the genre writer looks like, and more importantly what they sound like. Consider Throne of the Crescent Moon among the books that I insist you read. 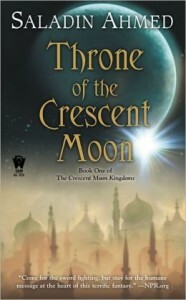 For an alternate point of view, read Aidan’s review of Throne of the Crescent Moon by Saladin Ahmed. Justin Landon is the overlord of Staffer's Book Review, and co-editor of Speculative Fiction 2012, a 2014 Hugo Award nominee for "Best Related Work". I’m a big fan of Ahmed’s short stories as they seem to have a depth to them that I felt was missing in Throne. I wanted to like it more than I did. To some extent, and maybe this is on me for expecting otherwise for heroic fantasy, I felt that each character was fairly cliche. I didn’t have the investment in them that I’ve had for Ahmed’s short story characters. I wish Throne had been about twice as long to allow space for similar depth and character development. The way it was written I felt like it almost could have been a graphic novel. In some respects, it reminds me of a similar disparity between Jay Lake’s short stories and his novels. All that said, I will read Saladin Ahmed’s next novel and hope that he spreads his wings more. Like Jonathan, I was also unimpressed (full disclosure, I listened to the audiobook). I found the characters underdeveloped, lacking subtlety, which led to some very predictable plot elements. The setting was interesting and well-developed, and the main plot line strong enough, but the predictable, cliched nature of several characters nagged at me the whole time through.